Surrealism has been a big part of this series and it makes sense how this style of art would lend instead to comedy. The expectations that are subverted and upended in surrealism are just as prominent in Dadaism, which was birthed through the anti-art movement in the 1910s. Towards the end of the century, Paul McCarthy was employing its uses to create video art, where the more straight-faced confounding it was, the funnier. The key art piece of the anti-art movement, Marcel Duchamp’s Fountain (1917), seemed to set the stage for toilet humour that would grow in popularity through the century and into the new millennium. What began as a parody of art became the norm when toilet humour reigned supreme throughout the comedy films of the ‘90s. In this same decade, McCarthy was making his own films filled with a sort of potty humour, along with an array of other Dadaist comedy, with McCarthy’s aggressiveness and frustration turning into purposefully unintentional humour. McCarthy has a preoccupation with fluids just like Jackass. 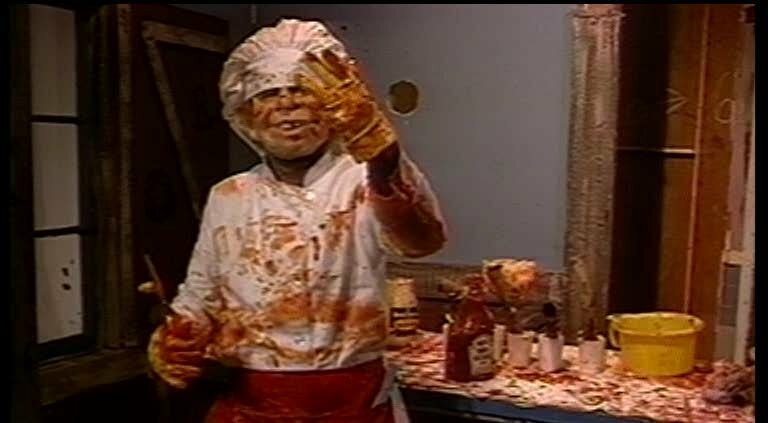 His performance piece Sauce (1974) shows him washing his body with tomato sauce, and in later works using actual bodily fluids like faeces. There’s a comedic satisfaction in watching such a mess whilst remaining in the safety as a spectator, and that satisfaction can lend itself to a sense of comedy. This eight minute piece, as well as the 30 minute Class Fool (1976), seem to take one gag and aggravatingly repeat it over and over, taking it past the point of absurdity and patience-testing and simply resort to a time-wasting existential horror. McCarthy’s tedious, aggravating-on-purpose dicking around continues in Bossy Burger (1991), though this scene features a more concrete comedic sensibility. In this scene where McCarthy (donning an Alfred E. Neuman mask) is giving a presentation on how to draw, there may be no actual “jokes”, but the humour is a little more palpable than straight-up purposefully pointless Dadaism – it comes from both the sudden and inexplicable mood changes and the lo-fi access channel-esque aesthetics. This would’ve seemed overly-surreal in the ‘90s to be considered humorous, but it now seems like a precedent to the similarly humorous and similarly contextualised [adult swim] shows such as Tim and Eric’s Awesome Show Great Job, Check It Out! with Dr Steve Brule, and The Eric Andre Show. These shows share the same affinity for identifying the vulnerability in an innocuous setting (like a cheap low-budget public television setting) and bringing about a painfully aggressive destruction upon it, showcasing wild and unpredictable mood changes. McCarthy’s seminal piece is Painter (1995) and that may be because of how much he looked within himself as an artist and all the artists in the art world as a whole. Similarly to Bossy Burger, McCarthy (now with cartoonishly fake nose, ears, and hands) lampoons self-help educational art videos, though right from the get-go permeates it with a sickening sense of anguished awkwardness. His instructional videoing devolves further and further into madness, resulting in him making whooshing sounds as he paints, spinning around in circles, cutting off his finger, and peeing in a pot-plant – sounds exactly like your typical [adult swim] broadcasting. 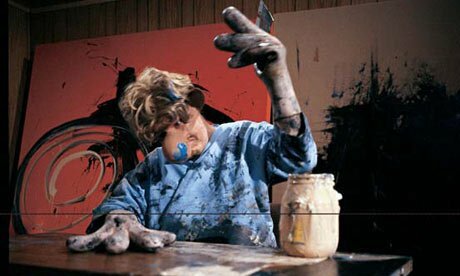 Despite the absolute absurdity, not the mention the discomforting mood of this “humour”, the kind of Dadaism of Paul McCarthy’s work would very likely connect with an audience more than any other comedy films discussed in this series. Although the kids these days aren’t huge on McCarthy (and if they are, they’re probably more familiar with his recent art installation sculptures instead), his brand of humour as espoused in Bossy Burger and Painter would resonate with a younger audience today. As pointed out in The Washington Post article ‘Why is millennial humour so weird?’, the kind of comedy accepted by a younger generation can be particularly absurd, to the point where the expected punchline is that there’s no punchline, and actually the whole joke is itself the punchline. This meme-hungry attention-deficit generation are evidently keen on the kind of comedy that doesn’t slowly trickle out at you, but hits you at full force like a brick wall. This kind of comedy may be present in some modern TV shows, but has yet to invade the cinema screen (yet). Hotel By The River : 'TIFF' Review - A Surprisingly Endearing Heartbreaker!